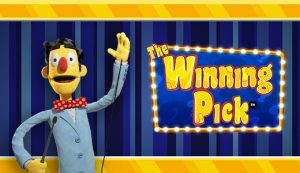 Playing The Winning Pick from Novomatic is just like playing a TV gameshow! Gameshows have been family favourites for years. There’s something about a gameshow that just gets people excited. The hosts, the games, the prizes and the contestants – it’s all just super fun! Family Fortune, The Price is Right, Wheel of Fortune, Jeopardy, Who Wants to Be a Millionaire?, they’re all household favourites. You’ve probably spent hours watching gameshows with your family just wishing you could be a contestant. Well now, thanks to Novomatic, you can! The Winning Pick is a new slot game that’ll make you the contestant of your very own gameshow. With all of the bright lights and the fun graphics, you’ll feel like you’ve stepped right onto the stage with your favourite gameshow host. If you want to play The Winning Pick for fun or for real money, you’ll want to choose the best Novomatic casino! Our team review online casinos so you can make an informed decision before you sign up somewhere. Wherever you sign up, you’ll certainly enjoy this slot game. There are 25 paylines that run across 5 reels. The highlights of The Winning Pick are the bonus features. When you get these bonuses, you’ll love playing out your own gameshow! The Winning Pick deviates from the normal Novomatic formula! The card symbols aren’t values, instead they are suits! On the lowest podium of the paytable, you’ll see the diamond and the club symbols. The heart and the spade symbols have slightly higher payouts. Going up in value, you’ll also see: some cash, the WP symbol (on a TV) and the applause symbol (on a radio). The three top-paying symbols are the puppets: the green contestant, the assistant in a red dress and the host! 3, 4 or 5 matches of any symbol will award a payout if they fall on a payline. The 25 paylines pay from left to right and matches must fall consecutively. You can bet on less than 25 paylines by deactivating as many as you like. You’ll need to bet on a minimum of 1 payline, and your bet per spin will equal the number of active paylines multiplied by the bet per line. The paytable, which shows all the payouts for 3, 4 and 5 matches of every symbol, updates when you adjust your bet settings. You can gamble your wins if you want to add an extra gameshow-style element to the game! This extra level of fun makes playing The Winning Pick all the more exciting! Are you ready? Let’s play! There are two bonus games that you can win while you’re playing. But first, the Wild symbol. This is the logo symbol and, on top of being the symbol with the biggest payouts of all, it’s also the only symbol that can substitute for the other symbols. The bonus symbols are the only ones it can’t act as substitute for. These are the ‘Prize’ symbol and the ‘WP’ Scatter symbol. It looks a little similar to the other WP symbol, so check the paytable so you can see the difference. When you spin 3 Prize symbols in one go (on reels 2, 3 and 4), you can play the Instant Pick game! Choose one of these symbols for an instant, cash prize worth up to 8 times your bet! When three WP Scatter symbols land in one spin (on reels 1, 3 and 5), you can play the Winning Pick bonus game! The reels with the bonus symbol on them will turn into boxes and you’ll have to choose your pick amongst them. Some boxes will give you cash prizes, some boxes will allow you to unlock a reel and some boxes will give you a free re-spin! Will you make The Winning Pick? There’s only one way to find out!